Waringstown captain, Lee Nelson during one of the rain breaks in the game with Lisburn which was eventually abandoned. INLM30-206. Waringstown secured their place in the semi-finals of the Ulster Cup after an excellent 53-run win over Brigade on Sunday. The villagers, without five first-team regulars, produced a sterling display at one of the most difficult grounds to visit in the country. They will now face North Down in the last four at Comber on Sunday. The task won’t get any easier because they will again be without Gary Kidd and Kyle McCallan - and Greg Thompson is attending a family wedding. 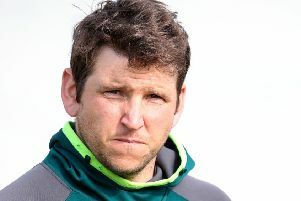 Thompson will at least be available on Saturday when Waringstown entertain a Carrickfergus side reinvigorated by a stunning win over CIYMS on Saturday. Even though Waringstown’s match with Lisburn was washed out on Saturday, it still turned out to be a good day for Lee Nelson’s team. Instonians, the reigning champions, were beaten for a second successive league game and CIYMS went down to that Carrick defeat. Nelson will be hoping for an improvement in the weather this weekend because a backlog of rearranged Twenty20 matches presents a new set of problems. Sunday’s victory was a hard-fought one, particularly with the bat where Waringstown’s top score was just 31. Ruhan Pretorious and David Dawson both made that total while captain Lee Nelson (27) and James Hall (27) also go t going without making the big score the visitors badly wanted. However, some important runs down the order from Stuart Kidd and Morgan Topping helped Waringstown post 196 for nine in 40 overs. Waringstown then had Brigade in trouble with the bat, Thompson taking the key wicket of Iftikhar Hussain for 35, stumped by Andrew Mitchell. At 83 for six Waringstown were big favourites but 54-run stand between Chris Dixon and captain Andy Britton appeared to be turning the tie on its head. Brigade went into the last 10 overs requiring 60 but Dixon fell to Stuart Kidd and that sparked the collapse as the last four wickets fell for just six runs. Eaglestone (4-14) bowled Nick Donnell, Richard Hepburn and Mark Simpson as Brigade were dismissed for 143. Ball sponsor for the game at Carrickfergus on Saturday is Eric Moore.